Thoughts on Maggie Bright, The Shrew, and Prayer. I am happy to read any book by Tracy Groot. Yeah, she’s an award winning author. And yeah, she’s somebody I’m glad to call my friend (name drop!). But on top of that, she’s a darn good writer who writes well (without preaching) about faith. This book, though? Maggie Bright? It’s my favorite. I loved the characters and wished they’d stick around awhile even after I’d finished the last page. People, she made me cry. That’s not easy to do. I rarely cry when reading a novel. What earned my tears? A lovely character called The Shrew. She was a little bit Hyacinth Bucket (for any Keeping Up Appearances fans) and another bit Mrs. Potts (from Disney’s Beauty and the Beast) and all the way fantastic, as far as characters go. Well, Mrs. Shrewsbury (her proper name) writes a letter at the end of the novel. In it, she talks about prayer. Prayer as what we say to God and what we DO for others. We pray as we move. It’s really beautiful and I’d love for you to read it all for yourself so you can experience the power of this story. Prayer is essential to this novel. But it was also what saved Europe from the Nazis. No joke. Often, I pray and feel like I’m just treading water. Ever feel that way? I suspect I’m not alone in this. But I keep on praying regardless. Why? Because I have to. I’ve experienced answered prayers. Mine and those of others. And I’ve seen the work of prayer when I use my hands and feet and watch others do the same. She’s right, you know. She is. 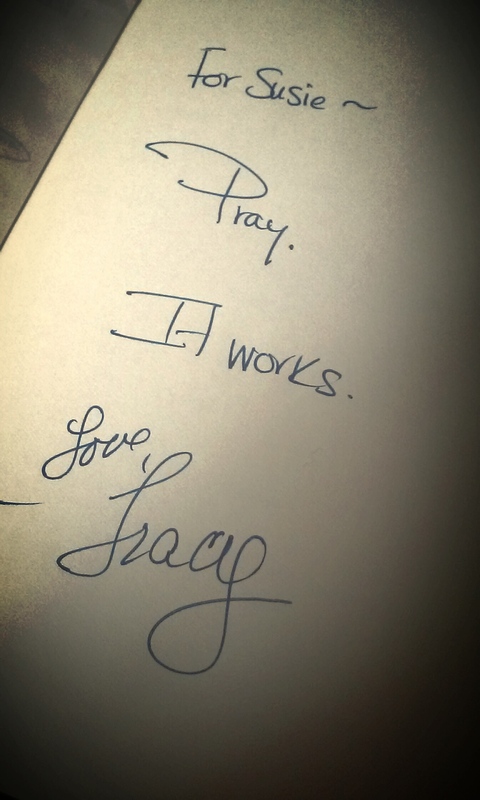 And now, when I peek inside the cover of my copy of Maggie Bright, I see Tracy’s encouragement there and I’m reminded. Prayer is in my quiet meditation on my Heavenly Father. It’s the peanut butter and jelly sandwiches I slap together for my kids. It’s the cup of coffee I hand my husband. It’s the smiles I share with others or the kind words and even the patient ones. Prayer is the tapping of my fingers on the keys of my laptop as I write. And prayer is in the words of a novel that so moves me that I can’t help but weep for the goodness of God for all His mercies. 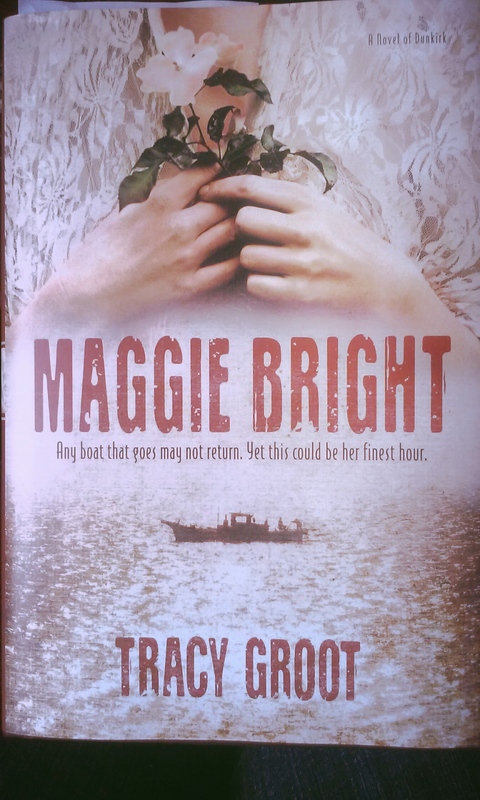 For that, I say a prayer of thanksgiving for my friend Tracy and her willingness to write such a beautiful novel as Maggie Bright. I’d love to know: What book (or books) have deepened your prayer life? Or maybe encouraged you in your life of faith? Sometimes these novels are even written outside the Christian Publishing world. I love hearing from you! I’m reading this novel right now! Thanks for your thoughts, and you’re right, prayer is what we need for everything! Oh, Suzy. Maggie Bright will be on your favorite list, I just know it. Prayer is like water and air. I need to be reminded of that often. Last night Eric and I were talking about the disturbances in our country. We decided that our response as Christ-followers needs to be prayer, not legislation. Legislation never changed a heart. The Holy Spirit never FAILS to change a willing heart. And that comes through prayer, I believe. Yes! I love this response, Jessie. I’m weary of people trying to elbow their way into forcing hearts to change. That can’t happen. It’s by gentle leading, loving, and all of that done with much prayer. It’s the humble way, isn’t it? And the way that can only see results because God makes it happen. Susie, I read this yesterday and you had me sniffling. Toward the end of writing the novel, when theme becomes stronger than plot, prayer come on stronger and stronger, and my heart’s prayer was that this novel would be about prayer. You answered this heart-wish with your post. Thanks, my friend.